TORONTO, Oct. 31, 2018 /CNW/ - CIBC (TSX: CM) (NYSE: CM) and the Greater Toronto Airports Authority (GTAA) are partnering on new infrastructure and service enhancements to ensure that the 47.1 million travellers who pass through Canada's largest airport annually can access modern banking services while on their journey. Under a new multi-year agreement, CIBC is expanding its footprint at the airport to include a new banking centre, which will provide passengers a total of six CIBC banking centres throughout Toronto Pearson International Airport from which to choose. 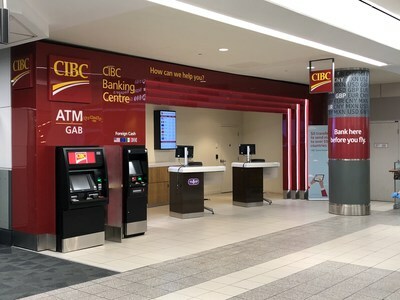 CIBC is also working to deploy a team of Mobile Financial Service Specialists to bring banking directly to passengers and employees throughout the airport. These specialists will provide access to digital banking services such as travel insurance or foreign currency. CIBC will continue to be the only bank servicing Toronto Pearson. "CIBC clients and air travellers can bank when, where and how they want while at Toronto Pearson, thanks to our renewed partnership and commitment to expanding services," said Tracy Best, Senior Vice President, Mobile Advice, CIBC. "We will continue to make sure those travelling through this vital transportation hub have access to great services, including any last-minute banking needs they may have to ensure a worry-free trip." The renewed partnership agreement will also include the expansion of CIBC's newcomer welcome service to Terminal 3. The service will be modeled after the current program in Terminal 1, which includes designated meeting point space, comfy seating and CIBC staff available to discuss banking options. "We consistently strive to be innovative in the experiences we provide for the millions of passengers who fly through Toronto Pearson every year. Partnering with CIBC has enabled us to do that in many ways – from the convenience of banking options to passenger relaxation spots to free baggage carts – our partnership has enhanced the options available for travellers. We know that the renewal of our partnership will bring even more value to passengers in the years to come," said Scott Collier, Vice President Customer and Terminal Services, Greater Toronto Airports Authority.